Alliance Medical Ministry is grateful to work alongside community partners addressing employment, transportation, health, housing, food insecurity, childcare, substance abuse, domestic violence, and immigration issues. If you are currently an Alliance Medical Ministry patient, and are interested in learning more about any of the resources below, contact Dr. Toby Bonar, 919-277-0500. The Boys & Girls Clubs mission is to enable all young people,especially those who need us most, to reach their full potential as productive, caring, responsible citizens. The Boys & Girls Club has seven locations in Wake County. Find out how to join the Boys & Girls Club. Learn more about the Child Care Subsidy Program offered through Wake County Human Services. Child Care Services Association is a nationally recognized nonprofit working to ensure affordable, accessible, high quality child care for all families through research, services and advocacy. Learn more about the Family Services (including finding childcare) offered through Child Care Services here. Project Enlightenment is an early childhood education and intervention program of the Wake County Public School System, serving teachers and parents of young children, ages birth through kindergarten. Parent resources, including workshops, parent counseling, and a resource center, available on-site. InterAct is the only provider of domestic violence and sexual assault services in Wake County, North Carolina. To view a full list of services provided at Interact, click here. Carroll's Kitchen is a nonprofit social enterprise restaurant dedicated to ending homelessness for women in Raleigh, North Carolina. We create opportunities for single women experiencing homelessness by empowering them through job training, life skills, and even housing. Alliance Medical Ministry is a referral agency for Carroll's Kitchen. If you are an Alliance female patient, single, homeless, and interested in learning more about the program, ask your physician or Dr. Toby Bonar 919-277-0500. Dress for Success Triangle serves under-employed and unemployed women in the Triangle by providing a network of support, professional attire and development tools to help women thrive in work and in life. Contact Dress for Success now. By training, equipping, and connecting churches, ministries, and businesses in communities all over the world, Jobs for Life helps prepare people for meaningful work through honest relationships, mentoring, work-force development training, and an ongoing community of support. Find a class near you. NC Works offers, among other resources, career, job seeking, education, workplace training, and labor market services. Interested? Step 1 of StepUp is an Employment Training Workshop, a one-week 8 am - 4 pm training session, where you'll learn skills like: networking, resume writing, how to dress appropriately, and interview preparation. The Food Shuttle's Culinary Job Training Program is currently not accepting new students as they restructure the program to better serve students. The Fostering Wellness Workforce Readiness Program is a 10-week program focusing on culinary training, employment skills and leadership opportunities for young people with a history of foster care in Durham, Orange, and Wake counties. Passage Home’s mission statement is to break the cycle of poverty for the communities we serve in Wake County. We do this by connecting families and neighborhoods to resources and opportunities. We prepare people to receive their blessings. By staying true to our values and focus, we continue to lead the charge on poverty in Wake County. 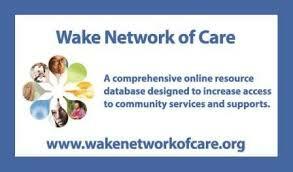 Visit Wake Network of Care for a list of Wake County food pantries, community gardens, meals/soup kitchens, farmers markets, mobile markets, and other information. Alliance Medical Ministry is a referral agency for Catholic Parish Outreach food pantry. Please ask your doctor or Dr. Toby Bonar for more information. The Hispanic Family Center is dedicated to empowering Hispanic families to become more integrated in the community and to improve their quality of life by implementing programs of education, health, job training, and referrals. For immigration services, see here. Neighbor to Neighbor offers a Latino Outreach program, working with Latino families in Raleigh to provide a place of fellowship, help with family needs, English language learning, and spiritual direction. The City of Raleigh defines affordable housing as total housing cost (rent or mortgage and utilities) that is no more than 30% of a household’s income. Incomes that fall within a certain range can qualify for reduced or subsidized housing. Find out if you qualify for income restricted homes. The Green Chair Project reuses donated household furnishings to renew lives of participants referred from area programs who are recovering after homelessness, crisis or disaster. Alliance Medical Ministry is a referral partner for the Green Chair Project. If you are interested in learning more about the program, ask your physician or Dr. Toby Bonar 919-277-0500. Utility Service Payment Assistance programs are located in different geographic areas in Wake County. The Campbell Community Law Clinic partners with non-profit agencies in the community to provide solutions to legal problems encountered by clients of those agencies. The clinic provides representation, advocacy, education and reconciliation for its clients while delivering valuable and practical knowledge to law school students. Alliance Medical Ministry patients interested in utilizing this resource, call Dr. Toby Bonar, 919-277-0500. Legal Aid of North Carolina provides free legal help to low-income North Carolinians in civil cases involving basic human needs like safety, shelter, income and more. Alliance Behavioral Healthcare helps people with mental health and substance use issues and intellectual/developmental disabilities. A range of services are offered to individuals without Medicaid. While some of ABH's services are available only to individuals insured by Medicaid, there are services available to people not covered by Medicaid. Carolina Outreach provides comprehensive Clinical Assessments, Outpatient Therapy, Psychiatric Evaluation & Medication Management, and Family Centered Treatment for adults and children. Fellowship Health Resources provides behavioral health services to improve the quality of life for individuals living with mental illness and addiction. Services include: behavioral health outpatient clinic; substance abuse intensive outpatient program; DWI assessment and treatment; and peer recovery services. Hope Services provides clinical assessments, including: outpatient services, psychiatric evaluations, medication management, in-home services, etc. Monarch Mental Health offers behavioral health services and long-term services and supports for people with intellectual and developmental disabilities. SouthLight Healthcare provides Outpatient, Residential Treatment, Opioid, among many other treatment programs. Turning Point Family CARE is nationally accredited through Commission on Accreditation of Rehabilitation Facilities (CARF). Staff collaborates with public agencies, families and private resources to ensure the success of our consumers in all areas of their life domains. Teens ride free! To get a pass, teens or their guardians must fill out a registration form and provide proof of age. The passes are available at various locations in Wake and Durham Counties (click here for full list). Wheels4Hope is a faith-based, volunteer-driven, nonprofit organization dedicated to helping economically vulnerable families and individuals by providing them reliable, affordable vehicles. Alliance Medical Ministry is a referral agency for Wheel4Hope. If you are interested in learning more about the program, ask your physician or Dr. Toby Bonar 919-277-0500. Learn about available Financial Assistance. Read about the Y's camps, childcare, clubs & activities, tutoring, and more. You Call This Yoga (YCTY) is focused on helping the physically challenged and under-served improve their quality of life with yoga. Join YCTY at Alliance Medical Ministry on Wednesday evenings each week.